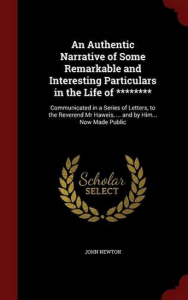 John Newton, pastor, song writer, and former slave-trader, wrote his auto-biography in a series of fourteen letters to a friend. They are quite remarkable in literary genius and spiritual insight. They remind one of Daniel Defoe’s Robinson Crusoe as Newton traveled the sailing world in hunt of treasure to sell (sometimes even slaves) and often found himself grounded in some port with little or no means to survive. The story of his final conversion during a storm at sea when the sailors tied themselves to the ship for days at a time to keep from being washed overboard, is exciting and moving. This narrative was first published in 1764, the very year that Newton began his pastoral ministry in Olney. He accepted a position in London in 1780 and remained there until his death in 1807. This edition is published by Regent College in Vancouver.